View More In Drywall Stilts. Installoo® - We are a German company founded in 2007 that specializes in the sale and distribution of drywall stilts. Our aim is always to improve on what's good and deliver the highest quality standards. We offer our range of stilts here. Our stilts are distinguished by the fact that they can support a weight of 265 lbs, and not just 228 lbs. 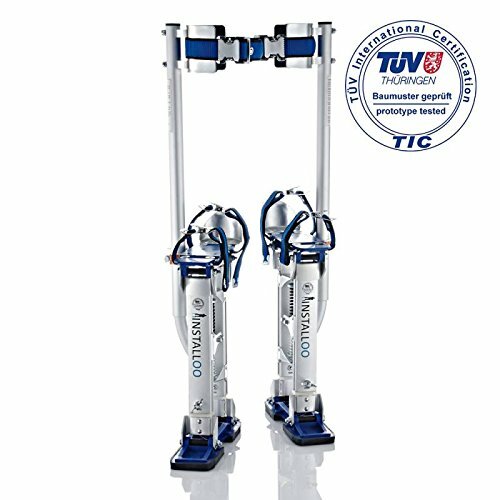 In addition, they experience constant quality controls via the German Technical Monitoring Body, TÜV. These Installoo work stilts from our Pro-Line in size L have adjustable heel plates and foot straps and safety metal buckles. They can be used for drywall or electrical work, painting, drop ceilings, other applications and all jobs where you need to be up to 18"-30" higher than normal. They are made of aluminum allow for strength and light weight. Installoo stilts have a 265-lb. load capacity. They have adjustable leg bands with padding for comfort, dual spring action for flexibility, and rubber soles to prevent slipping - with a focus on safety, perfect workmanship and the use of skilled craftspeople. Please note that, if problems do occur, we request that you contact us first. We will resolve any issues as quickly and effectively as possible. Ultralight: Only 8.6 lb per stilt! Rubber soles to prevent slipping and a wing bolt design for adjusting the height without tool.s. Under constant German technical certification and safety compliance and including instruction manual in English. If you have any questions about this product by Installoo, contact us by completing and submitting the form below. If you are looking for a specif part number, please include it with your message.